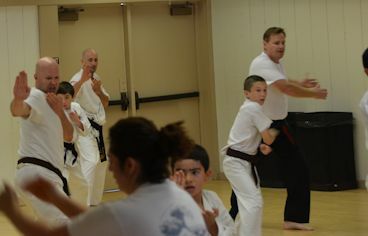 This ongoing class teaches the traditional Chung Do Kwan style of Tae Kwon Do, with emphasis on kicking and hand techniques, progressively building strength and conditioning. This style does not practice contact sparring. Men, women, and children of all levels learn together. Attend as many classes per week as desired. We encourage families to participate together. Every style of martial arts is slightly different. 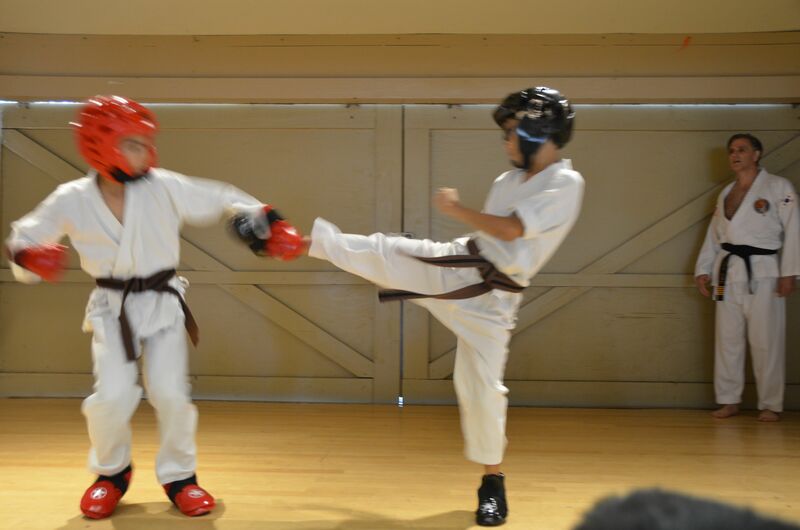 Our classes are about getting physically fit, mastering our forms, and developing friendships. You progress at your own pace. Regardless of your intial level of physical fitness, confidence, or strength, you can achieve a level of fitness and self assurance that you never dreamed possible. Our motto is 'Spirit, Focus, and Power'. In all of the workouts, we practice these three dynamics. When everyone brings energy to the class, we all perform better. Focus helps us to develop our minds as well as our bodies. Strength and Power come from practice. We have been an active part of the Irvine Community for the last 28 years. We hold our practices in several community centers, each class is one hour long. Once you register with the city, you are welcome to attend all classes open to all belt levels. Time at each belt level only relates to ACTIVE (based on attendance of 3 classes per week) participation and is a rough measure. The minimum times are for exceptional adult students with very frequent weekly attendance. Children will often take longer to advance than adults. Our classes last one hour. All belt levels and all ages work out together, except for one special class per week set aside for brown and black belts. Most of our classes are held at the Northwood Community Center or the Heritage Park Community Center. We recommend that you attend at least three classes a week, and we encourage families to join together. Select the "Belt Info" tab to find out more about our belt testing fees and belt advancing schedules. The minimum age for our classes is 7 years old or 6 years old with a participating parent. We require our students to have ghi pants and a white t-shirt. The cost of the club t-shirts can be found here.